Olivia Thirlby was in a film called The Darkest Hour immediately before she played Anderson in Dredd, so this week's tag-line seems apt. Anyway... Judge Dredd starts a new story by Rob Williams and Henry Flint, featuring the very welcome returns of both Dirty Frank and Judge Smiley from Trifecta. It will be interesting to see where all this goes. There's also an interview with both creators, but I'll read it later. Brink is back, and gets straight down to business. It feels like the threat level has gone up a bit now. Skip Tracer has Colin MacNeil on art duties this time, which is good to see. Too early to know what to make of the story yet, but I'm willing to give this series a second chance. But the highlight for me this week -- completely unexpectedly, because I thought it would be Brink or Kingdom -- is Fiends of the Eastern Front. To be honest, I wasn't expecting to like this, because the original series was for young children and the sequel a few years ago didn't do anything for me I'm afraid. But I really like this new one, which is set in the Napoleonic Wars. The art by Dave Taylor is beautiful, and while I daresay there will be people who wish Colin McNeill was back on this strip instead of on Skip Tracer, I approve of the choice of artists on both stories. And the script (by Ian Edginton) is an excellent introduction to the series. No prior knowledge required, as this is a prequel and episode one tells you all you need to know. I now have high hopes for this series. There is news about a classy free gift to annual subscribers to both comics. Looking forward to getting mine. Next week's cover is Fiends. This is a very good prog, with no misfires for me. Not trying to disrespect the cover image but am I right in thinking that Geroge Perez has has hand/wrist problems since his eighties heyday? Similar to the reasons that we probably won't see any more Ian Gibson sequentials? Inside the Prog I find the combo of Rob Williams and Henry Flint is much more successful than Wagner/Flint in the Meg400 which felt a bit like a throwaway gag to me (sorry, John). The return of Brink and the evolution of Dave Taylor's art style on Fiends are the other highlights for me. Hmm, I haven't seen it in the flesh yet, but while I originally felt the image was a little bland (if you wanted something in similar style but with more feel for the characters, just get Robin Smith back! ), I actually think it looks pretty great when plastered in all that busy cover dress. And if it drags in a few wandering DC fans, job jobbed! TordelBack sums up my thoughts on the cover. I’m not that fussed about it as a stand-alone image, but it works very nicely as a cover. And that’s the point. I think too often these days comics have the reverse problem. Not trying to disrespect the cover image but am I right in thinking that Geroge Perez has has hand/wrist problems since his eighties heyday? My understanding is he's had eye problems and some other medical things. Certainly I've seen news of him being poorly a couple of times over the last few years. Still I think the cover is fine, even if Mortis looks like an ant head rather than cattle skull... though the look of the dark Judges could well be deliberate to reflect the story! Anyway to things internal its bloody fine Prog, though like Meg does lack a new strip, a couple of options that practically fill that role do compensate for this. Dredd - Well its not the nice cosy intro Dredd we sometimes get in these big celebration issues is it. I bloody loved it and Jez Flint is on fire. Have to be honest much prefered this to the Dredd in Meg 400, though that might have been better for new readers? Brink was absolutely devine. How the hell it managed to be kinda escapes me as on the surface it did nothing special. Generic, almost cliched brutal start to set the stacks and created a horrific atmosphere from the off. This spins into a tough first day at work... well to be fair it manages to make this apparently mundane second scene all the more tense than the opening scene. Its just done so very well and I'm bought in already as I image a new reader would be too. Skip Tracer could serve as a new thrill as I had to read the summary box to remind myself of its premise even though it only finished its first story a few weeks ago so unengaged was I by that opener. This time to be fair for a new reader this is a fun and thrilling opener and MacNeil is on fire. Just hope it managers to make me care less for the led this time. Nowt so far. Anderson does a better job than the Meg story in introducing Cass. Shame she kinda had to be rescued by Joe, but it worked as a reflection on her glorious past. I enjoyed this and loved Jake Lynch's art, at times he's O'Neill, at times he's McMahon, he throws some Flint in and does a glorious Bolland pastiche at one point. Most impressively for all that he's always Lynch first and formost. Sinister Dexter is always a treat and his one is a nice relaxed set up. Gives a nice bit of tone and character for the new reader and love that Ray's still got those Thought Ballons - I wonder where that and the tatoos are going? Oh and another artistic masterclass by the Mighty Yeowell this time. Great if light stuff. Fiends of the Eastern Front - could also serve the role of new thrill its been so long since last time. A great welcoming opener... well welcoming in the chilly (in both ways), bloody and thrilling way that any reader can embrace. Just great stuff and the art... well the art is just breathe taking. The winter scenes almost literally as they feel so bloody cold! Kingdom - love this thrill and this opener gives me no reason to doubt I'll love this story. Its very smart in the way it just rattles on for the regular reader yet I suspect gives the new all they'll need to feel fully immersed and engaged. A bit of a masterclass there and Elson's art is so strong in the Gene Hackman powerful way. He packs a punch! So there we have it barely a missed step and I think most thrills will serve the new reader just as well as this seasoned old grump. I do have to make special mention of the art here. Its without exception stunning and in some cases much more than that. Just a zarjaz showcase of the depth and variety that Tharg has to offer. I'd be staggered to find a more beautiful comic on the eye this year and without a house style in the ... well house (of Tharg). Quite superb. My understanding is he's had eye problems and some other medical things. Certainly I've seen news of him being poorly a couple of times over the last few years. That's it, eye problems, more Ron Smith than Ian Gibson then. But eyesight and hands must be the twin nightmares for freelance artists. Agree with your splendid review, Colin. Much better expressed than me. What a fantastic Prog - the best in a long time. It felt like a year end Prog and we still have that to come. I am not sure why, but the cover really works - it seems way better than the preview last week. Dredd's gun really stands our against the 2000AD logos. The Dredd tale is a really strong opener. I generally don't like features in my Prog, but this one was great. I dug out Progs 2004 to 2006 and re-read "Act of Grud" after reading it and then re-read Dredd. It really adds to it and I would recommend everyone to do the same, if they have them handy. Really looking forward to the rest of this one. Brink as ever is just awesome. Top, top stuff. I am not sure why but I feel much more engaged with whathisname in Skip Tracer already. Colin MacNeil's art seems very similar to Paul Marshall's on this strip. Not sure if that is him deliberately trying to make it look like that or not. I guess Dylan Teague's colours also contribute to this, as he seems to be using a particular palette for Skip Tracer. I would though rather have Paul Marshall on this...only so we can have Mr MacNeil back on Dredd, where he belongs. Anderson starts strongly, but has a bit of a weak ending in my opinion. Jake Lynch is also one of the most improved artists over the last couple of years, with a some really strong stuff. But for me, this isn't quite up to that lofty standard. Some of the anatomy just doesn't look quite right. Sinster Dexter similarly starts strongly and ends weakly. 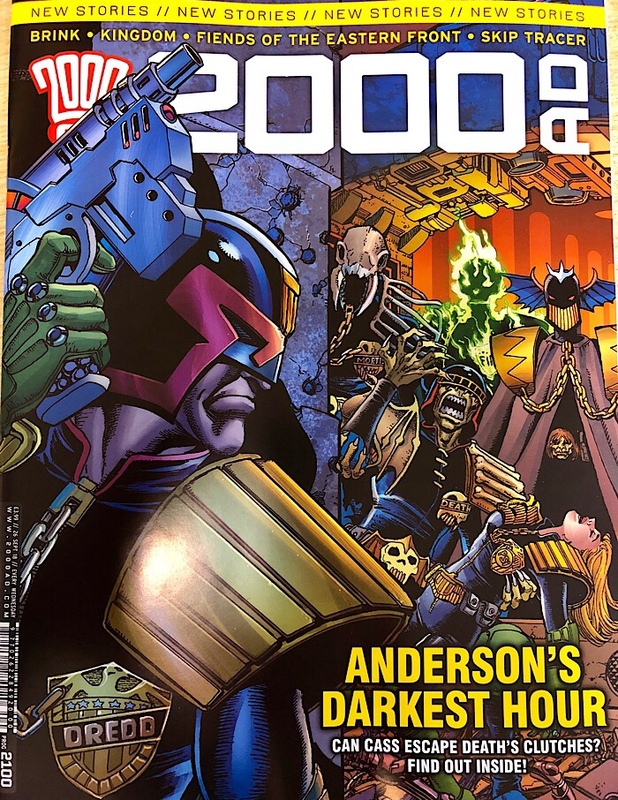 But looking forward to its return in Prog 2109. Fiends to the Eastern Front is very enjoyable, even if it threatens to go over old ground storywise. Hopefully that won't be the case. The art is very different to what we have had on this series before, but I was totally in to it by page 2. Kingdom is a story I have been threatening to do a complete re-read on for a while. I read the first two TPBs in the spring but did not complete the rest as it would require putting my back Progs in order. I think this new series is just the motivation I need to do just that. Zarjaz! Cover to cover Zarjaz! Best prog I've read in ages. Real artistic and writing talent on display here. Don't know where to begin so I'll just say, thank you Tharg keep up the good work! I've just re-read "Act of Grud" in progs 2004-06 and I echo Magnetica's advice to do so. It's a very helpful reminder of what's going on. Glorious, start to almost finish. Between this and the Meg, I hope poor Dan Abnett is getting enough sleep. TordelBack sums up my thoughts on the cover. I’m not that fussed about it as a stand-alone image, but it works very nicely as a cover. It does. Previous doubt rescinded. Couple of other things about this week’s Prog. I hope the use of psi powers to overcome difficult situations doesn’t become a thing in Skip Tracer. In the light of the current thread on Johnny Alpha’s age and general comments from time to time on Dredd’s age, neither Sinister, Dexter or Billy seem to have aged a day since the strip started. Is that right or is it just me?